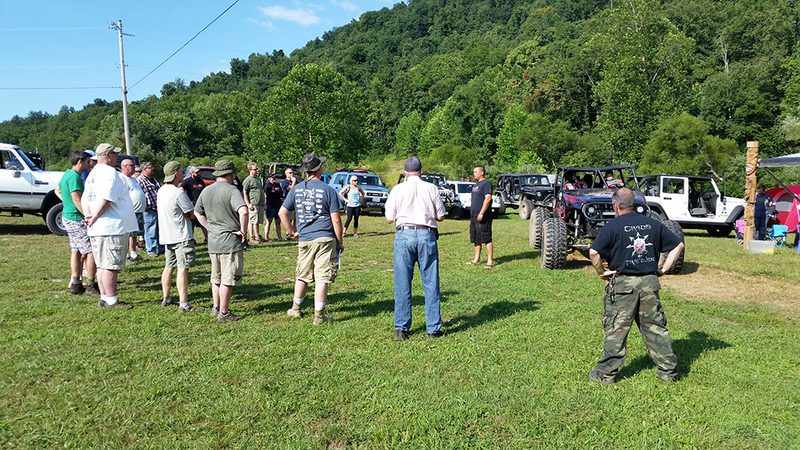 Chaos Offroad Park | Capital Off Road Enthusiasts, Inc.
One of the many benefits to joining an off-roading club or attending off-roading events is the connections you make with like-minded people, clubs, and organizations. During the PA Jeeps Show, CORE made a connection with Chaos Fab Shop (http://chaosfabshop.com/) and the owners, AK and Maria. The guys over at Chaos have worked on some of our member’s rigs and we love having such a great fab shop so close to the D.C. metro area. 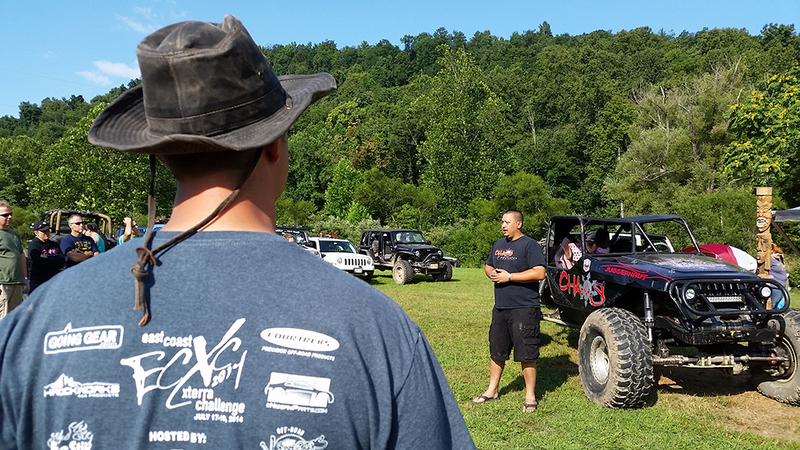 Chaos has a connection with a local land owner in Capon Bridge, WV that has worked with them to create the Chaos Offroad Park (http://chaosoffroadpark.com) – 400 acres of trails that are like a skate park for 4x4s! 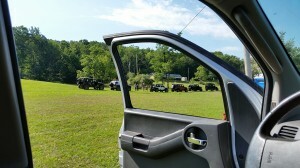 The park is open for pre-arranged event weekends all year, except during hunting season. Although CORE was going to miss the last planned event of the season, AK and Maria were itching to throw one last event before the season officially ended. 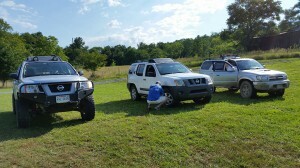 And so a few clubs, friends, and family were invited out to the “Splash, Bash, and Crawl” event! Since CORE had never been out to Chaos Offroad Park, and Chaos is trying to get the word out about how great it is, we decided to take lots of pictures and document exactly what people can expect when coming to Chaos Offroad Park. The park is very family-oriented and is very communal. At the time that we went, a day pass is $45/driver and $10/passenger, age 13 and up. If you want to wheel for the whole weekend, the cost is $65/driver and $10/passenger, age 13 and up – and that includes camping on the property! The camping and main staging area is a giant clearing with several camping fields large enough for big groups and trailers (but no hookups). They bring out plenty of porta-johns. There are also plenty of hotels close to the park. While there are no individual campfire rings, there is one large communal campfire in the center for all to enjoy. 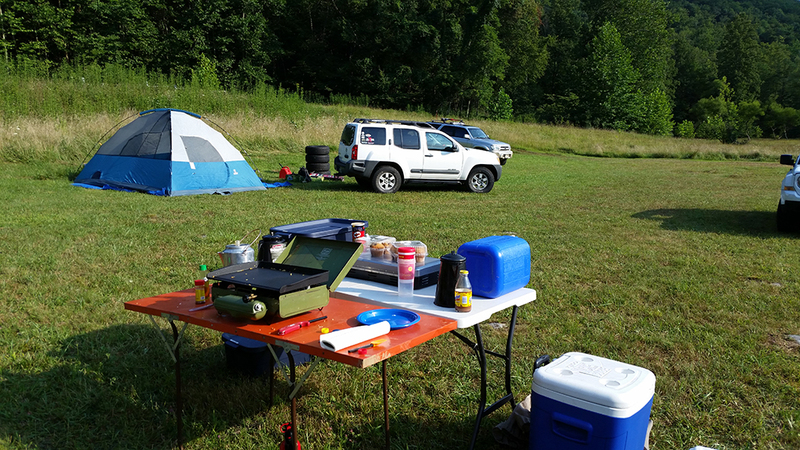 The park is only a few miles from town so you are never too far from gas or food. There is a Liberty gas station at the Capon Valley Market just 6 miles up the road that has everything you could possibly want – gas station, a food counter, hardware store, and even a mini taxidermy museum – it is West Virginia after all! We arrived at the park Friday night and, after a quick check-in with AK and Maria, we set up camp in site #2. The county has a rule that you can’t park or drive your vehicle inside your campsite at night, so once you finish setting up camp, you need to park your vehicle just outside your campsite. That night they had a small group go up on the mountain for a night run, but the CORE members were exhausted and decided to get a good night’s sleep. 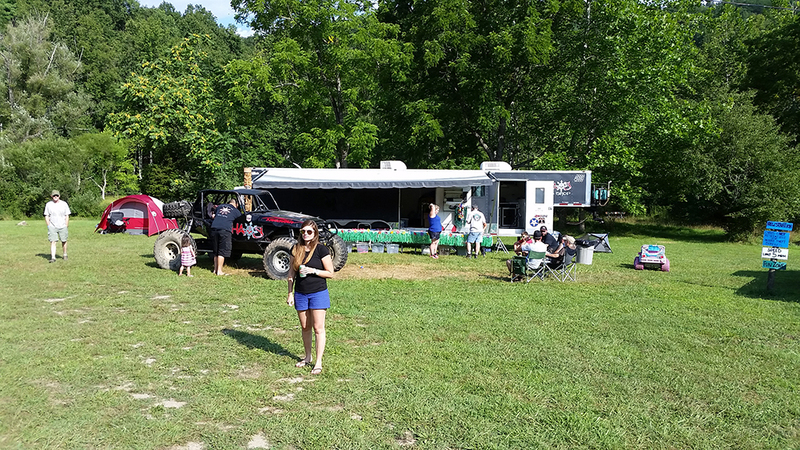 Saturday morning we headed over to the “staging area” – which is basically AK and Maria’s camper – and checked in for the 9 am driver’s meeting. 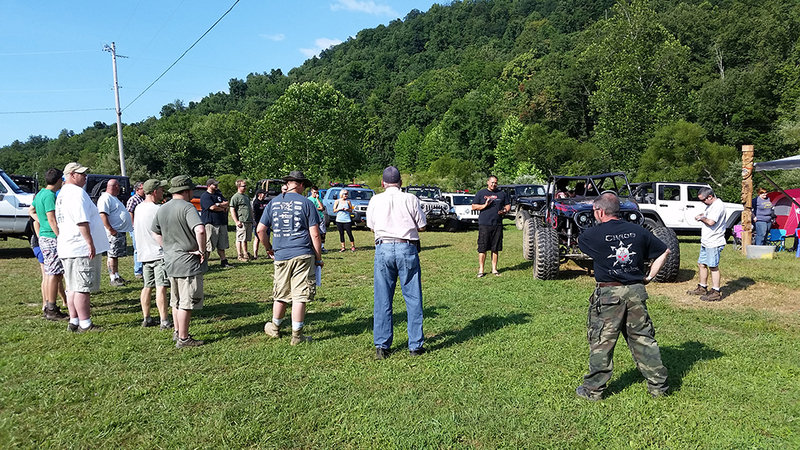 Here they give you a rundown of the park and the rules, and give you recommendations on which trails your rig can manage. The park is set up like a skate park – with a stocker-friendly loop going around the entirety of the property. This allows mixed groups to go together and enjoy the entire park, letting built-up rigs play on the big obstacles and stock vehicles always have options for bypassing. In the morning they planned on splitting us up in to groups led by trail guides in order to show us around the park and so we could familiarize ourselves with the trail system. 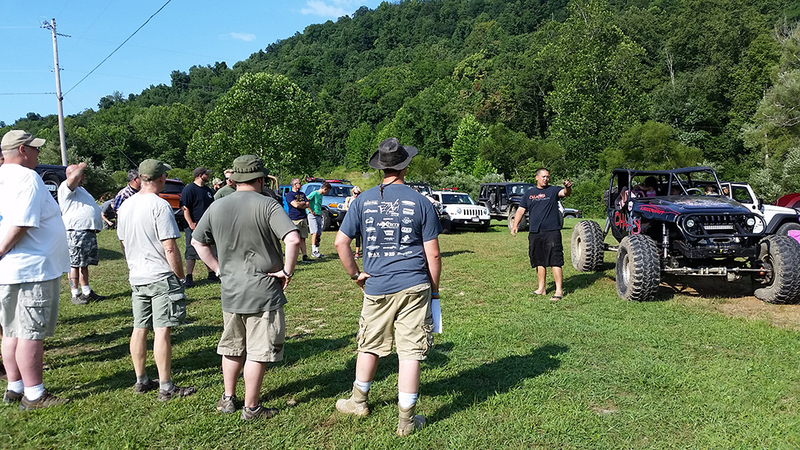 These trail guides are always available to take groups up during the weekend, but once your group has a good feel for the park, they allow you to go up without a guide as long as you have two or more vehicles and recovery gear. 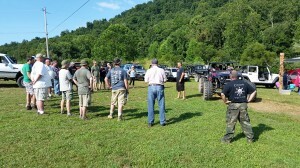 CORE members joined the 1 & 2 groups, which mostly stayed together for the rest of the day. The property is extremely beautiful – very lush and green! 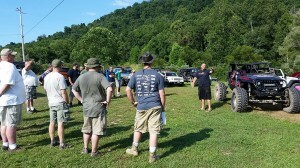 The trails up the mountain can be steep and rocky, providing a fun challenge for stock vehicles and newbies. There are plenty of opportunities for more built-up rigs to play all along the trails – and if you see something you want to try, most obstacles loop back around to the main trails so it’s easy to rejoin the group. They’ve even created various obstacles that you won’t find naturally like series of moguls, made of various natural materials and different heights, just scattered throughout the park. 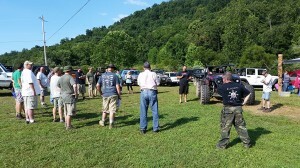 The land owner, John, loves 4x4s and even came out on the trails with his Jeep and joined a few of the groups. You are free to roam a bit off-trail if you see something that might be fun – but you should still hold to the principles of Tread Lightly and respecting the opportunity to play on this amazing property. They have their map uploaded to the Maplets app, so if you are looking for a great way to follow the trails and know where the obstacles are, we highly recommend downloading that! Making his way through the rocks. We spent the morning exploring the property and being shown where all of the obstacles were. We first hit Sinkhole – which has a fun dip for someone with a slight lift. 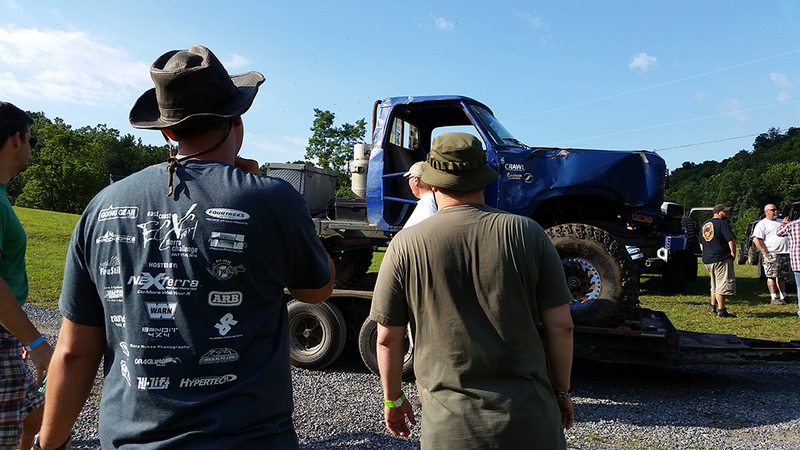 We spent a while at the Gloryhole obstacle which is basically a pit with many entrances and exits – some challenging for a built up rig and some challenging for a stock vehicle. Definitely fun for the whole group! We ate lunch on top of the mountain at Sandy Ridge. The weather is much cooler up there and the breeze is amazing – it’s a great place to stop for lunch and is big enough for a huge group to park off-trail. Unfortunately it doesn’t have much of a view in the summer, but we imagine it would be beautiful in the winter. 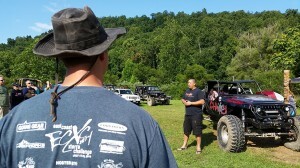 In the afternoon we spend some time in Eckoh Rock Garden and watched the more built-up rigs tackle the rocks. 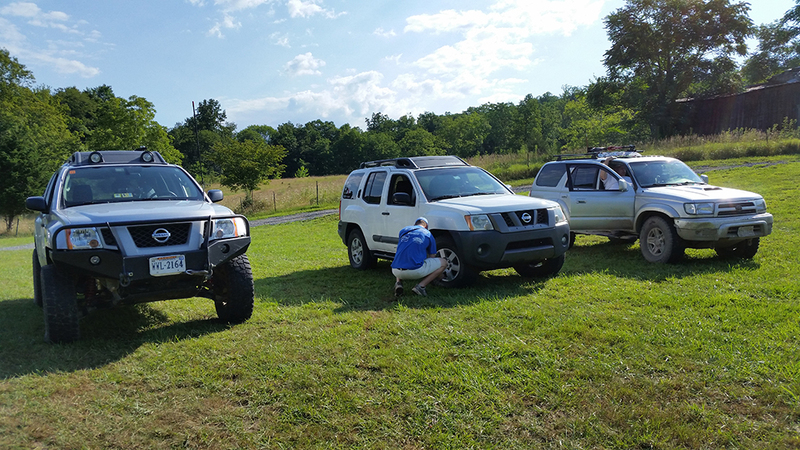 And we took a very fun trail up the mountain called Off Limits, which was extremely rocky and maybe a tad too much for the low, stock vehicles. Since the park isn’t well known yet, they haven’t had much of an opportunity to see non-Wranglers tackle the obstacles. 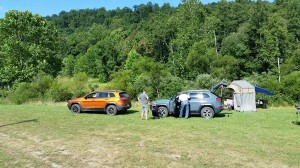 Everyone had a blast watching the Xterras, Cherokee Trailhawks, 4Runner, and a Patriot give them a try. Saturday evening we decided to go into town to a little restaurant that AK swore had a steak that would change our lives. Sounded pretty good after a day of wheelin! It’s called That Place, and it was delicious! 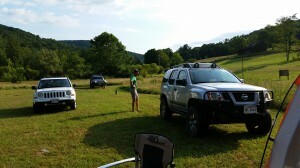 That night the guides decided to go on a night run and a bunch of the guys from CORE decided to jump in Andrew’s Xterra and ride along. They did the big loop of the park, including some steep/rocky hill climbs and wash outs. They had a great time. When they got back to camp, Chaos set up the huge bonfire and had it raging into the early hours of the morning. Sunday we felt like we had a pretty good handle on the park and decided to venture out on our own. On our way up the mountain, AK popped up in front of us and led us up to Poser Rock -a huge rock that is basically a ramp that allows for a great photo op for most trucks. 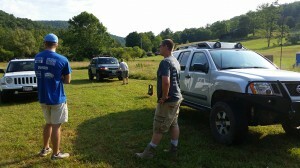 He helped Stephen in the Xterra (with no lift!) up on the rock and got some awesome pics. And even taught him a thing or two about how to nudge up the rock face by only feathering the clutch (no gas! no gas!). After that we decided to leisurely ride the stocker-friendly loop popping in and out to enjoy various obstacles and watch other groups playing on the obstacles. We decided to take it easy and just enjoy the morning ride – hoping to head out around lunch time. On our way out we stopped in at the owner’s house – which is just near the main entrance to the trail system. He has set up an airing up station on the side of his garage that will inflate all four tires at once in under a minute! There is a small donation box next to the station to thank him for installing it. After packing up we said our goodbyes and thanked AK and Maria for an amazing weekend! They even invited us to go with them to the next park over which has an amazing swimming hole fed by a natural spring, game rooms, canoes, etc. (only $10/person or $15/family). But unfortunately we had to get back home – maybe next time! And the best part of leaving was that it’s only an hour and a half ride back to the DC metro area!! We had an amazing time at Chaos Offroad Park and can’t wait to go back. The property is beautiful with a variety of great trails and the atmosphere and mindset of the entire park is right up our alley! 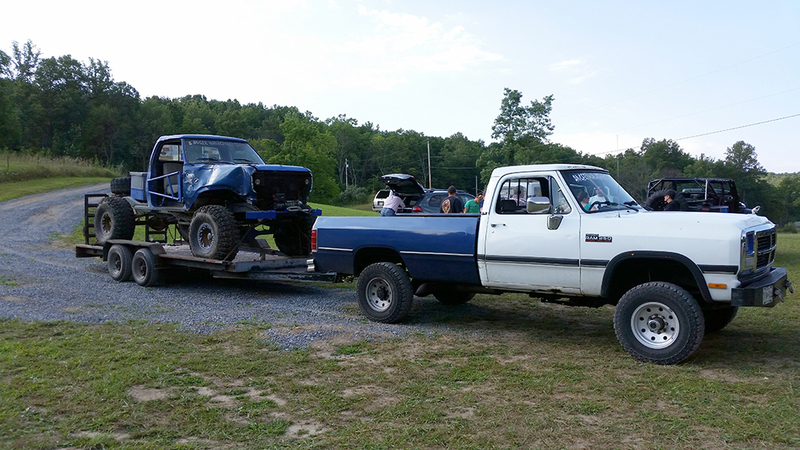 We love that you can ride together in groups that have both stock and built rigs – and BOTH have fun on the same trails. We love how family-oriented the park was and that everyone came together to ride the trails and sit around the campfire at night. But we also loved that you could go out with a smaller group and ride independently without worrying about breaking unnecessary rules, accidentally taking the wrong trail, or getting yourself in over your head like you might at other parks. As long as you are respectful of the property and the safety of yourself and the people around you – you will have a GREAT time at Chaos. And it’s so close to home!! The owners have a lot of big plans for this park, and we can’t wait to see what they come up with in the future. Trail report written by Cherie Taylor. 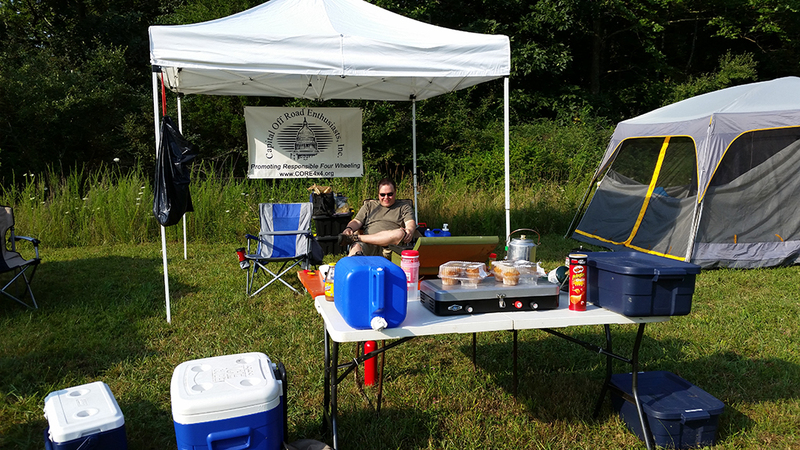 Pictures courtesy of Cherie Taylor, Fred Granruth, Erik Ramseth, Roland Thro, Stephen Rappe, and Toby Turpin.